For asset tracking applications that require heavy impact or water resistance we offer our RFID Hard Tag. For asset tracking applications that require heavy impact or water resistance we offer our RFID Hard Tag. Constructed of durable impact resistant polycarbonate, this product features a hermetically welded housing that protects the subsurface printed label and the RFID inlay from rigorous environments. Inside the housing the air gap between the inlay and the metal surface provides for a longer read range than similar products. Affixing methods include mechanical fasteners and/or adhesive. The polycarbonate housing protects the RFID Hard Tag from environmental conditions that could affect the performance of the inlay. 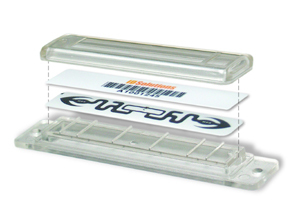 The label component of the product features subsurface printing that may include variable data such as bar code and/or human readable numbers — allowing users to utilize both bar code and RFID technologies. Four-color processing allows you to promote your company with a label that shows off your company name or logo. Metalcraft's digital printing process ensures even the most detailed logo will look crisp and clean.